Let’s move on to the recipe now. As I told you on our fb page yesterday, this is one of our most delicious appetizers ever! It is the August version of dakos! Let me explain what dakos is! Dakos according to wikipedia is a Cretan meze consisting of a slice of (soaked) dried bread or barley rusk (paximadi) topped with chopped tomatoes and crumbled cheese, olives and flavored with dried oregano. 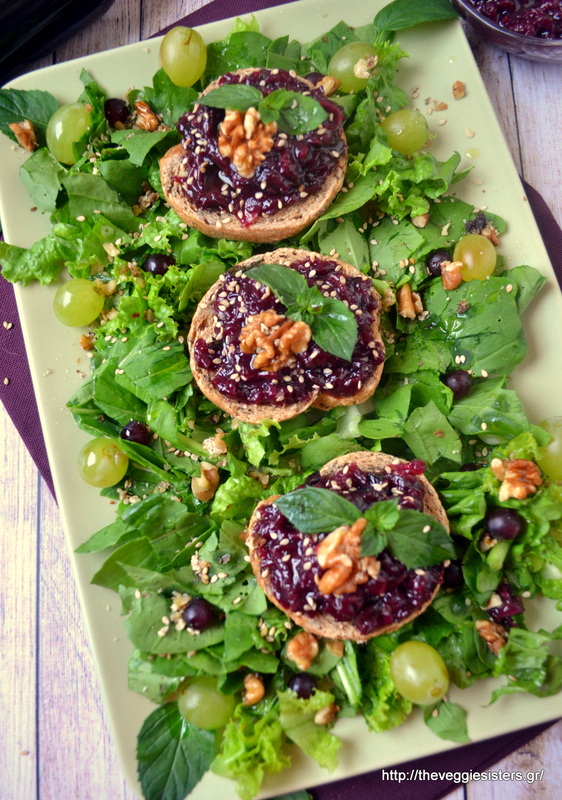 Instead of using tomato I made a grape sauce and combined it with refreshing mint, earthy walnuts and spicy rocket. Sweet+refreshing+spicy flavored dakos that make your taste buds explode! I didn’t top it with rocket for aesthetic reasons but when you make it, don’t forget to eat dakos with rocket. It is a magic combo! If you eat cheese, a good quality gruyere would be a good choice. But I am telling you, this beautiful appetizer is so tasteful that doesn’t need anything more! Let me know your impressions, if you make it! In a blender pulse grapes until smooth. Transfer them in a saucepan, add 10 mint leaves (chopped), onion and let cook on medium heat. After a few minutes add olive oil, maple syrup, vinegar and season with salt and pepper. When liquid is evaporated, remove from heat. Allow to cool. On a platter put rocket and lolo verde (rocket is obligatory, lolo verde is optional! ), grapes, sesame seeds, walnuts and spray some olive oil. Place the rusks and put sauce on each one. 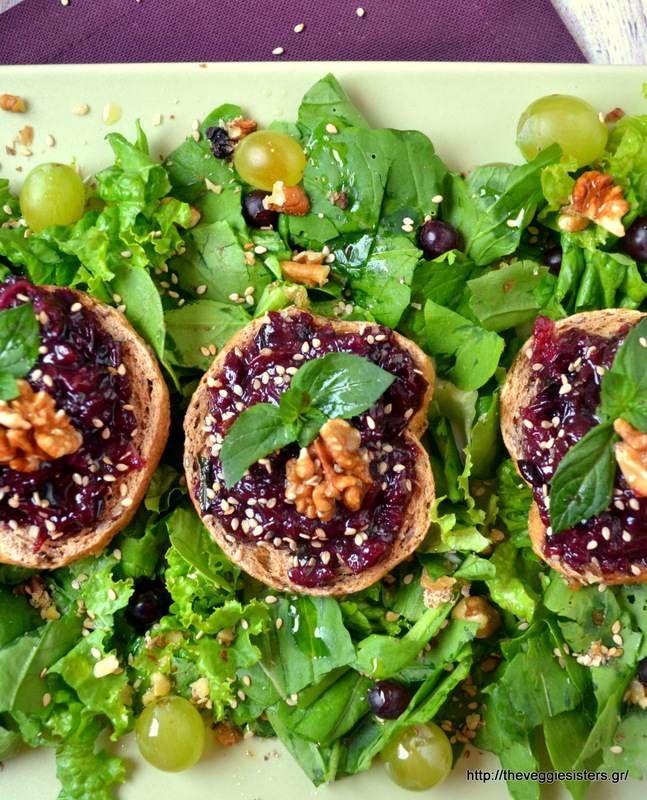 Sprinkle with sesame seeds and top with walnuts and mint leaves. Enjoy! 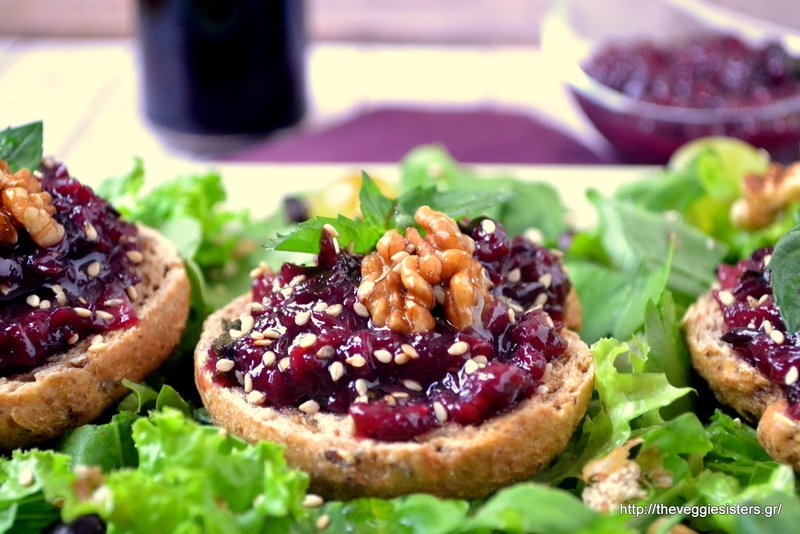 Share the post "August dakos with grape sauce, mint and walnuts"